Miochol-E miotic agent kit is an intraocular solution. 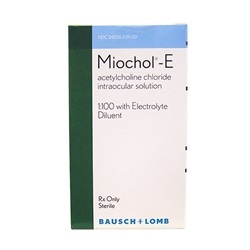 Each blister pack contains: one vial of 20mg acetylcholine chloride powder for intraocular solution, one 2mL ampule of diluent, and one 0.2 micron sterile filter. Manufactured by Bausch & Lomb. NDC: 24208-0539-20. Comes 1 kit per box.